Last night, I personally wrote Jonah Goldberg, the editor-at-large of The National Review Online, to express my observations on one of his latest blog entries. Mr. Goldberg, who was hoisted into the national spotlight due to his mother’s friendship with Linda Tripp, dug up an eight-year-old article in The Boston Globe in order to propound the argument that Senator John McCain cannot use a computer because of injuries he sustained as a prisoner of war, a claim that was repeated today by none other than Karl Rove. Well, I guess it depends on what you mean by “extraordinary.” The reason he doesn’t send email is that he can’t use a keyboard because of the relentless beatings he received from the Viet Cong in service to our country. But they then say he doesn’t even know how to use a — you know, doesn’t send e-mail. Well, this is because his war injuries keep him from being able to use a keyboard. He can’t type. You know, it’s like saying he can’t do jumping jacks. Well, there’s a reason why he can’t raise his arms above his head. There’s a reason why he doesn’t have the nimbleness in his fingers. I am learning to get online myself, and I will have that down fairly soon, getting on myself. I don’t expect to be a great communicator, I don’t expect to set up my own blog, but I am becoming computer literate to the point where I can get the information that I need — including going to my daughter’s blog first, before anything else…. I use the Blackberry, but I don’t e-mail, I’ve never felt the particular need to e-mail. 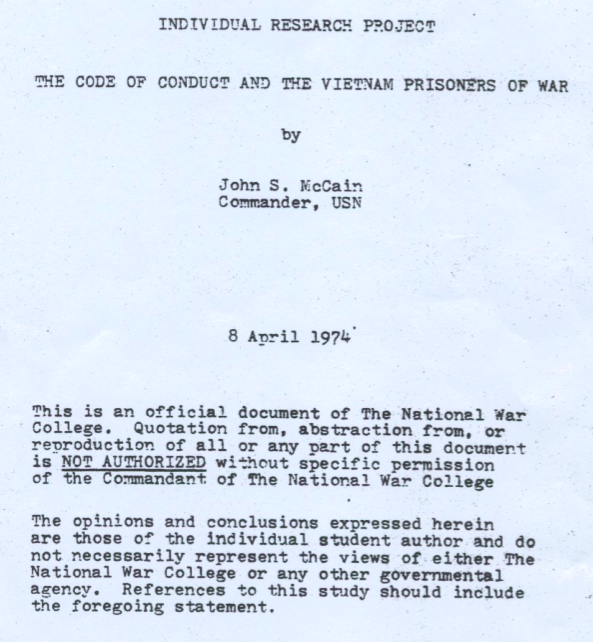 The title page of Senator McCain’s hand-typed essay to the National War College, 1974. Please don’t mistake the intention of this post: I have the utmost respect for Senator McCain’s service and sacrifice to our country, and I certainly don’t mean to diminish the extent of the injuries he sustained as a prisoner of war. But the attempt to deflect criticisms of McCain’s self-admitted computer illiteracy by falsely suggesting this is due to a physical disability is offensive– not just to the Senator himself, but also to the millions of disabled Americans who, despite their conditions, learn how to adapt and adjust. It’s a ridiculous excuse– not one propagated by the McCain campaign, but one that is being broadcast by individuals who seem to lack even the most basic understanding of the ways in which disabled people can use computers, individuals who, when backed into a corner, only know how to lash out by invoking hyperbolic invectives– as if the criticism of McCain’s computer illiteracy is somehow making fun of the injuries he sustained in Vietnam. Sure, it’s not the most important issue in this campaign, and maybe, to some, it’s silly that the Obama campaign would even point out McCain’s computer illiteracy. But the phony outrage, constructed upon a phony diagnosis of Senator McCain, is exploitative, ignorant, and patronizing. Pardon me for this, but Jonah Goldberg, to me, will always appear far more limited and disabled than the young man I tutored. To me, it’s far more constraining to live in a continued state of solipsistic self-righteousness and cynical dismissiveness than it is to live in a world that celebrates people who, despite their physical disability or any other limitation, refuse to use their conditions as an excuse to remain ignorant. As a child, whenever I became frustrated with my own physical disability (cerebral palsy), my late father would tell me, “Son, everyone has a disability. It’s just that people can see yours.” In his view, the unseen handicaps were often the worst– racism, bigotry, arrogance, ignorance, selfishness, and addiction– conditions that prevent people from understanding their common humanity. Still, the point remains: When you exaggerate or exploit another human being’s physical limitations as an excuse for their willful ignorance, you are actually stripping them of their common humanity and cheapening their struggles. Why don’t we ask John McCain if he can type. Everyone want to draw conclusions, but no one really knows but John. I read an article from a few months ago in which John McCain described how he can surf the web and read blogs because he can use a mouse. I can’t remember if he mentioned keyboarding. Perhaps he can punch a key, but is too slow because of his infirmity to make it worthwhile. We don’t know. Also, just because quadriplegics can use the computer by blowing into a tube doesn’t mean that John McCain should go to such extremes, even if he has the time. I’m sure he has plenty of people keeping up with the web news and keeping him informed. Everybody knows it all, including you, and no one seems to understand there are two or more sides to most issues. Why not wait and see what’s true. Otherwise, you look stupid. If the Senator can use a Blackberry and can write with a pen, then he can (and does) type on a keyboard. I challenge you to find a physician or a physical therapist who would say otherwise. Such a task does not require one to possess high-functioning motor skills. And as someone who has spasticity in his hands, I can personally attest to this. That said, Senator McCain, by stating he is learning how to surf the Internet and can use a PDA, has already implicitly acknowledged his ability to operate a keyboard. Indeed, there is empirical evidence (see above) that he does know how to operate a keyboard. Qualitatively, the motor skills and hand dexterity needed to do those tasks are essentially the same needed to operate a keyboard. I understand the hypothetical notion that the Senator may believe he simply doesn’t have “time” to learn how to use a computer, considering he can be kept informed by those around him who do know how, and I think anyone who has followed Senator McCain’s campaign can recognize the man is in good physical condition and demonstrates little sign of the overt physical disability (i.e. comparing him to a quadriplegic) to which you imply could exist. To me, such sentiment lacks a fundamental understanding of the complexities of the panoply of physical disabilities, and in so doing, it demonstrates a patronizing arrogance. The young man I tutored, for example, was not quadriplegic; he has spastic diplegia cerebral palsy. If my tone is too strong or caustic, please accept my apology in advance, but this is an issue for which I feel strongly. And with all due respect, we have already heard from the Senator (indeed, he can use a computer– one can be functional but not literate on a computer), and I fail to recognize the need to defend such an absurd and patently false assertion (made by individuals outside of his campaign) regarding McCain’s limitations. Again, with all due respect, by suggesting he is so physically impaired that he cannot even use a keyboard (though maybe he can “punch a key”), you are unwittingly and dramatically overstating his limitations. Throughout the past thirty years, we have all witnessed McCain’s capabilities, and the attempt to blame his computer illiteracy on war injuries is demonstratively disingenuous. Again, it’s not McCain who is doing this; it’s people like Goldberg and Rove, people who assume no one will protest or challenge their flagrant and insulting exploitations and manipulations. But I think McCain and his campaign should take you up on your request. They should answer, once and for all, if Senator McCain can type on a keyboard. After all, Senator McCain “allegedly” (I use the word facetiously) typed up an essay in 1974 for the National War College. I suppose we are to believe that McCain dictated this essay to a typist, right? Or did he write it out by hand (which, again, would require some degree of hand dexterity)? Maybe someone should ask Mr. Goldberg or Mr. Rove: If he can’t use a typewriter, then how did he manage to type a 40-page paper only one year after he was released from the Hanoi Hilton? This is only one example of how Mr. Goldberg’s and Mr. Rove’s argument completely falls apart, further illustrating their capacity to exploit whatever they can in order to deny inconvenient truths. Earlier, in a March 2006 interview with Fortune magazine, McCain said his work style didn’t require computer usage. But he did not cite his injuries. And I suppose you’re right: It’s possible he wrote the report by hand and had someone else type it. I concede that. But again, you don’t need to be an orthopedic hand specialist to know that if you can write out forty pages by hand, then you can certainly learn how to use a keyboard or a typewriter. Maybe you’ll disagree for the sake of disagreeing, but all of the evidence I have encountered, including the Senator in his own words, suggests that he is actually learning how to use a computer and knows how to use a PDA. A lot of CEO’s and older people still refuse to use the internet, etc. As a matter of fact I know one head of a multimillion dollar corporation that still uses the telephone only and has no cell phone nor any interest in learning how to use a computer.. He has people that do that for him and runs a very tight ship. Just because you are not computer liiterate is no reason that you are not able to run the country. no, actually, i agree. i was just posting an opinion. i really think this is much ado about nothing. like you i wish the election would stick to issues, but, like most national elections we have all ended up in the gutter. Lamar: I do know something about disabilities, but I wouldn’t presume to know the details of John McCain’s. I posted the following two comments on another site. It’s my own opinion, but even when alexcenia writes that because she has hand tremors and can type, then John McCaion must be able “to do more than he lets on,” I see very faulty logic. Most of you people don’t have a clue because you don’t know the nature of McCain’s disability. I had polio 57 years ago, and I look fairly normal, and I can lift 80 pounds over my head. However, if I try to keep my arms raised over my head with nothing in my hands for more than a minute or two, it becomes impossible to continue. Don’t presume to be experts in John McCain’s physical abilities. If he can type for a couple of minutes, but no longer, then using the computer for typing emails is useless, despite an ability to Google and read blogs, etc. Give it a break folks. I should add: Why should John McCain with his money and large staff bother worrying himself with email drudgery. I’m computer literate, and surfing the web can be very entertaining and enlightening. However, as I said, I consider email to be drudgery–at least weeding out the crap to get to the few worthwhile emails I get. If I had a staff, I’d say “print them out and put them on my desk.” That’s probably what he does. Forget about aids, except possible voice recognition stuff. How many people out there have learned a new program of any significance in the past year? Now I’m giving it a break. This is stupid, and yes, I’m stupid for participating. It’s about ego, isn’t it. Lamar: Perhaps he dictated the 40 pages. Incidentally, I think the ads coming from both campaigns are trash. PS: Here’s a link to the ABC blog on this subject. It was interesting. Keno, sorry, I’m just not buying it. We have heard from the Senator, and he says he is learning how to use a computer, that he knows how to operate a Blackberry, and that he can call up the New York Times online. He called himself “computer illiterate,” never once suggesting his physical condition prevents him from operating a computer. Again, the disability argument isn’t being propounded by him; it’s been propounded by right-wing political hacks who cynically see an opportunity to suggest Obama is somehow making light of his service to this country. That said, this is rather silly. I posted this to point out the extent to which people will lie about and exploit another man’s injuries in order to defend him against his own self-admitted computer illiteracy. At the end of the day, though, this is just another distraction, and while some voters may feel more comfortable with a leader who is knowledgeable about the world of technology (and “the Internets”), most of us (including you, I am sure) would prefer the conversation to be more focused on the big issues.